You have probably noticed already that I became totally addicted to making mandalas. I just love to design them. In one of the previous posts I wrote about the Colouring Mandala as a special meditation technique. And though I don’t practice meditation in its special way, I still feel the power of mandalas while designing and crocheting them. It is calming and relaxing indeed. And this is what I really need in my life – to have some time for myself and feel peaceful and quiet. My latest Mandala design is called Dandelion. And it’s my favourite also. 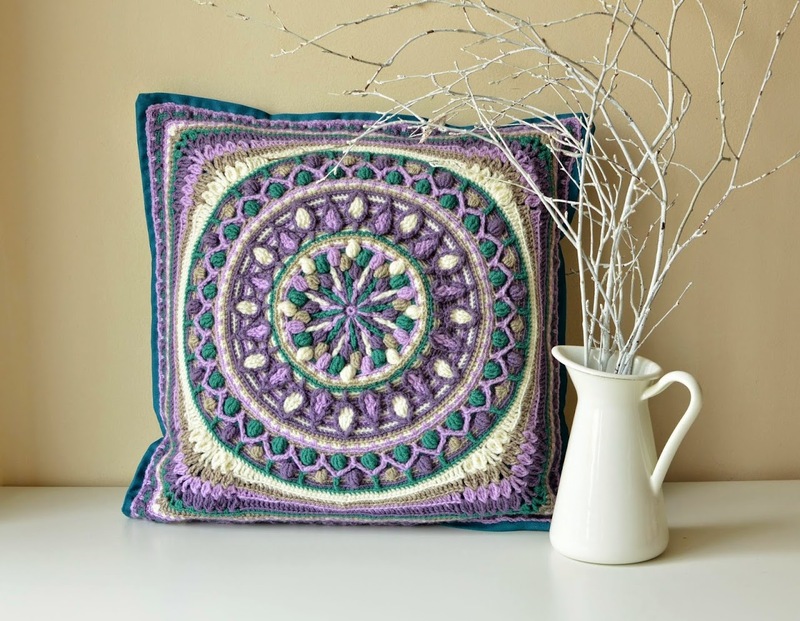 I normally design large circle mandalas in Overlay crochet or pillow covers made of granny squares with small mandala as a center. I didn’t try to square large mandala before but I have always wanted to try it. I just didn’t have a challenge strong enough to do that. But recently I’ve got one. 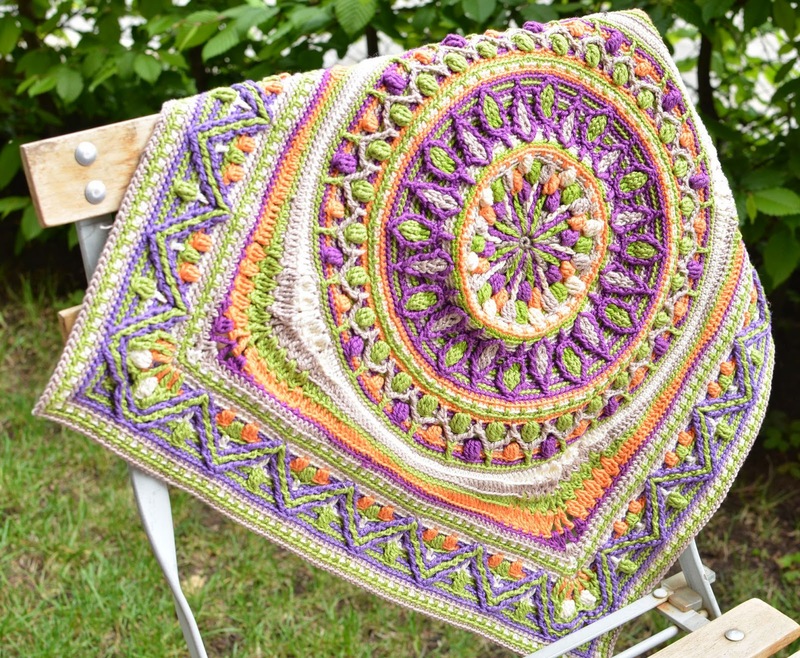 I guess many of you have heard about Sophie’s Universe CAL 2015 - an amazing colorful blanket with a beautiful central mandala hosted by Dedri Uys from Look At What I Made. I bet many of you are actually participating in this CAL and making wonderful blankets for yourself. I wish I had more time (and more yarn) to join it! By a lucky chance I’ve heard about the Deramores Blog Competition 2015. Six famous and brilliant bloggers were teamed up together and each of them chose one crochet trend to blog about. No need to say I fell in love with Dedri’s choice at once! 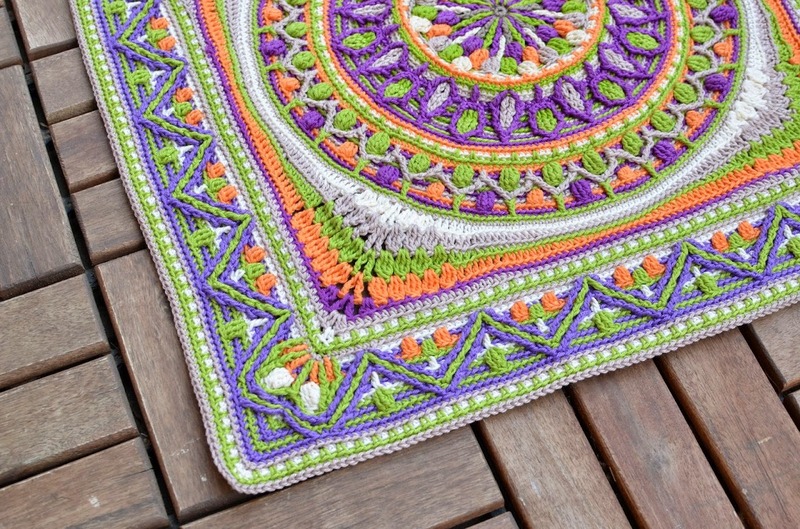 She has predicted Large Crochet Squares (and a kazillion colours) to be a popular crochet trend. 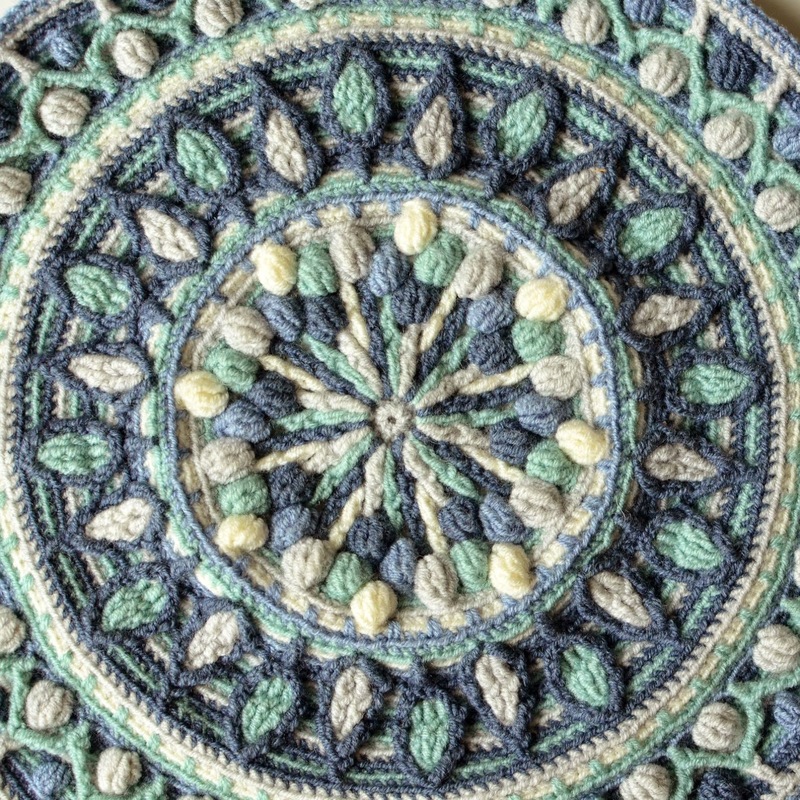 Well… I felt so excited and challenged and I immediately came back to my Dandelion mandala, my yarns and hooks. This is so much fun to square a large mandala. And though I did rip mine several times I had many hours of a pleasant crochet journey. And (Ta-dah!) here is the result! The Dandelion Border pattern is already available on Ravelry for purchase. I’ve made three Dandelion mandalas so far. The first one was designed using DK mix wool yarn in cold (northern) colors. Thanks to blue-mint-and-grey palette it was possible to achieve a nice ombre effect in the corners. I also used a zig-zag motif to form the square’s edge (almost the same as for enlargement of my Sunny Mandala into a rug). In DK weight my square measures 53 cm (21 inches). Its size is perfect for making a pillowcase. But I guess it will be much larger if worsted or even aran yarn is used. Due to usage of huge amount of overlay stitches, this square will be very thick in aran yarn and it can serve as a rug. So first part of Dedri’s task was completed. I got a large square motif with a central mandala. But she also wanted bright and contrasting colors to be used. And I decided to also square my second Dandelion mandala which I crocheted with pure cotton yarn in purple, orange, apple green, beige and white. Unfortunately I ran out of the specific purple yarn and it would take lots of time to order new skeins. So I decided to use a pale purple to form an edge instead. And I am satisfied with this decision as pale purple zig-zag nicely frames mandala but still gives a space for bright purple “petals” in the centre to nicely pop-up. This particular Mandala is a bit smaller and measures approx. 19 inches, but this is because the cotton yarn I used is very thin. I worked with 2.5 mm hook. And it is still good as a front part of a pillowcase. And here is my third squaring attempt - just a smaller version made for another pillow. I took progress pictures and notes while working on this project and I wrote a pattern for this border. It works not only for my Dandelion mandala but for every circle with 248 stitches on the last round. p.s. This post is my submission to the Deramores Craft Blog Competition 2015. Deramores is the UK’s number one online retailer of knitting and crochet supplies. Visit www.deramores.com for more details. Remember to subscribe to a weekly newsletter not to miss a single pattern and tutorial. And you can also follow me on Facebook, Pinterest and Instagram. Thank you Rita! I can't wait to see your finished Mint Cofee Mandala and Frozen flowers pillow. Please, share your pictures with me when it's finished! I love your use of puff and pop corn stitches. They look like petals. It's gorgeous. Hi Linda! Thank you! There are no popcorns used in this pattern. But they can easily replace the puffs to add more structure. I'm not sure which colors I like best --- I love them all!! I'm excited about the pattern for the edging being released. In the meantime, I think I'll go pick out my colors for the mandala right now! Thank you for all you do to inspire me/us! Thank you Mary. I will start to work on the pattern of this edge next week. its fabulous......I look forward to giving this one a try. Thank you Louise! I just love overlay crochet. No matter which colors you take the result is always great. This is absolutely stunning! Are you going to publish a pattern for your squared version. This is the first time I've been to your site and I'm totally blown away. You truly are an artist! This is beautiful! I specially love the blue one. Looking forward to the pattern! Thank you! I like both mandalas. They are different and translate different energy and mood. 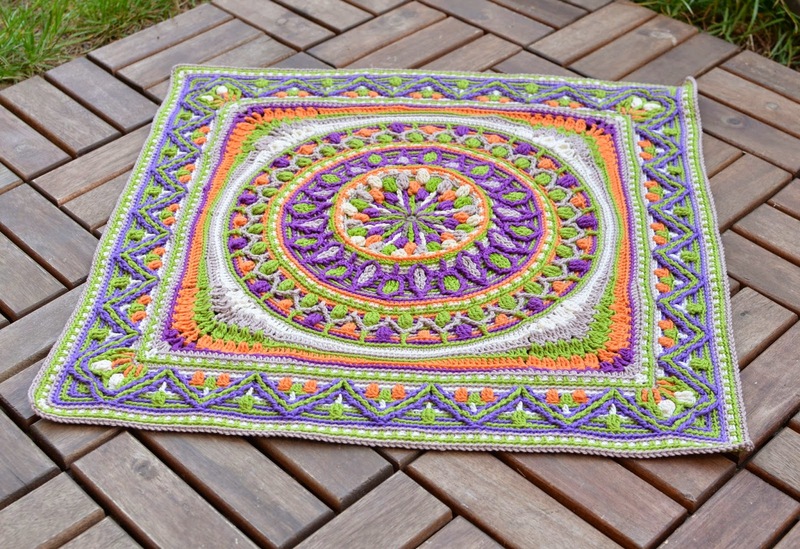 The pattern of Dandelion Mandala is already available in my Etsy, Ravelry and Craftsy shops. And I will start to work on the edge pattern very soon. Thank you! I guess it will be very thick and huge in aran yarn! This would make a wonderful CAL too. I will be looking forward to the squaring and border pattern, I have already bought the dandelion mandela, thinking on yarn colors now. I love your design & color choices. Absolutely beautiful! Wow! This is spectacular. You should be so proud - it really is a work of art and the best mandala I have seen. I can't wait to make it. I am happy you like it! This is a stunning work of Art! Will purchase the pattern of the square as soon Í finished my Sophie. Thank you! 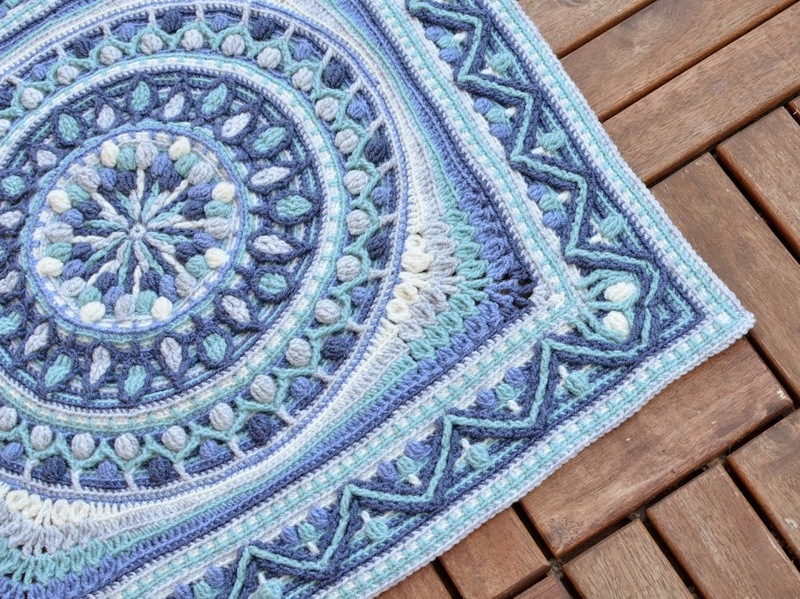 At the moment I only have a central mandala pattern available. But I hope to release the pattern for squaring it off in May. Thank you Tina! 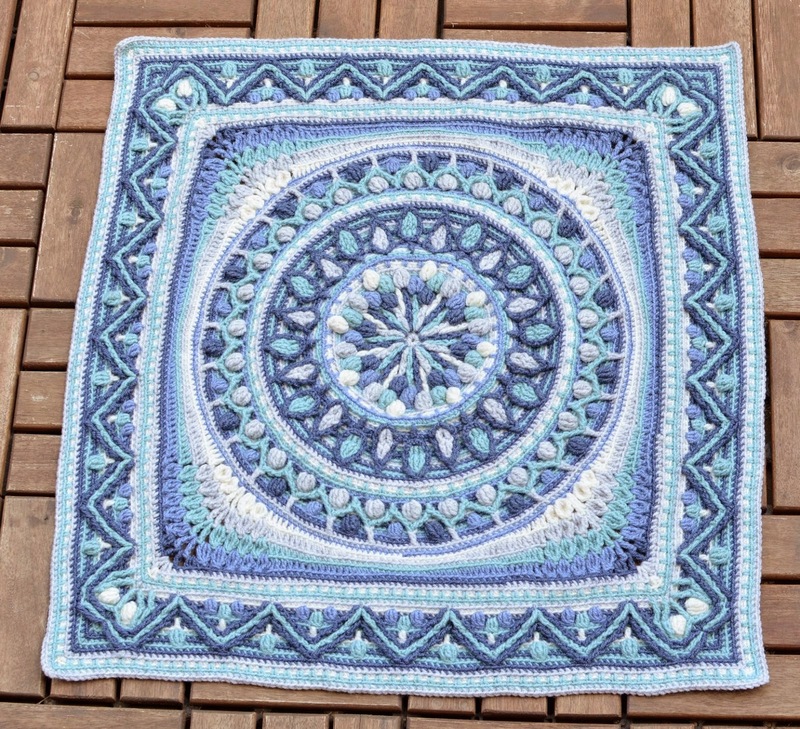 I was a bit unsure about using this pale shade, but I just had no choice :) I was quite short of time and needed to finish this mandala as soon as possible. Absolutely stunning! Cannot wait to see the pattern. I especially like how you worked up the corners! These are beautiful! I'm partial to blues, but your bright sunny colors have me rethinking my yarn choices. Good luck in the contest! Stunning! Here's hoping for a pattern soon! Thank you! I will announce release on my Facebook page and on my blog. Truly lovely work you have done! I'd love to have the full pattern - the one with the blues is gorgeous! Stunning, I would so love to crochet this after I am done with my Sophie. Yours is just as beautiful. Good luck on the competition. Thank you Dawn! I hope good luck will smile to me. What a stunning piece of work... I love it! Thank you very much Sandra!! just beautiful. I love the colors in all of them. makes a very stunning afghan. Hi Melissa! Please, contact me on Ravelry. Love these, the colors are gorgeous. I have the patterns for several of your mandalas and would love to purchase the edging to make some of them square. Bence şahane, tek kelime ile mükemmel. Tebrik ederim. I am an avid participant in the Circles of the Sun CAL which I absolutely adore I started off being really unconfidant and unsure if I could do it I can't tell you how many times I frogged the first 3 squares! By the 4th I was so happy with the skills I had gained and the 5th I made without any frogging,! ANYWAY just to let you know I have ordered the yarn for the Dandelion mandala which I LOVE and will download the pattern when I have finished Circles of the Sun so I don't get distracted! A million thanks is not enough HAPPY CROCHETING! I am so happy to hear you did your last squares without frogging! That's really cool! It's true that overlay crochet needs some practice, but once you understand the idea, everything becomes easy! :) Happy for you! Oh I can't wait I've bought your Dandelion Mandala pattern so excited about starting it! Thank you Gail! 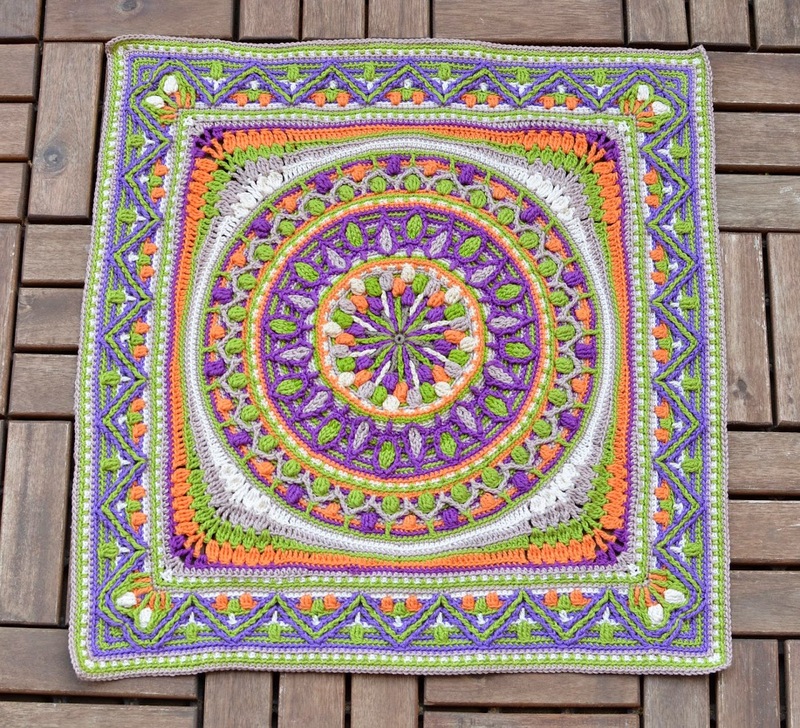 I used Alize Superlana Klasik for blue version of my Dandelion mandala and cotton yarn Catania for orange/purple. I so admire your work! Above you state some doubt about being an artist? Please DON'T! You are TRULY AN ARTIST - and your work is absolutely stunning! You and Dedri are my two favorite bloggers - or rather I should say my favorite crochet idols! Though in my early 70's, when I 'grow up' as a crocheter, I want to be just like you! I aspire to that level of talent and will keep working until I can achieve work such as you produce! It takes so much talent to design works like yours (and Dedri's!) and you seem to have that natural talent that most of us have to work twice as hard to achieve. Thank you for sharing your stunning mandalas with us - the inspiration you provide gives us incentive to keep working that much harder - to never give up! I am setting aside time this year to work on Circles of the Sun - and from there will purchase the Dandelion Mandala - and decide whether to square it or not. It's not just the stitch work, but the color combinations that you use that make your work stand out way above that of most. In the couple of years since I came back to 'hooking' after many, many years away, I've been so delighted to find this online community which, to me, almost seems like being given another 'family'! The love and sharing in this hooky community is inspiring in itself. I'm amazed that such talented folks like you, Dedri and so many more are so willing to help the rest of us learn this wonderful, healing craft of crochet. A heartfelt THANK YOU and God bless you! You are truly an inspiration - and YES! you are an ARTIST! never doubt that, please! I have just started crocheting but it is certainly my dream to be able to do this beautiful overlay mandala...long way to go.... You are truly a talented person! Thank you very much! :) do you also square them up? I am starting the Sophie Loves Lilla Bjorn Winter Blanket. I purchased the patterns, but the Dandelion Mandala is a different color in the pattern. I am using the colors white, azure, spearmint, mint, ice blue and petrol. How do I substitute these colors instead of the beige, purple, green, cream and orange? 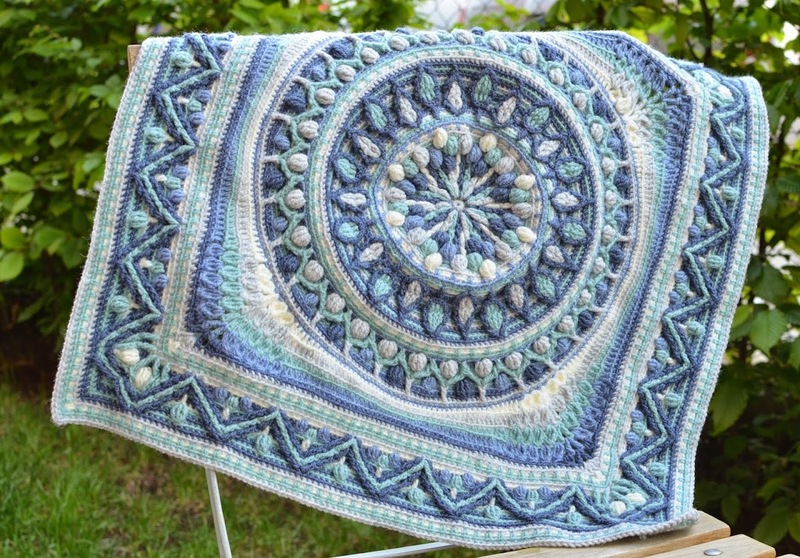 I used yarn Superlana Klasik by Alize for making “blue version” of this mandala. I used shades 208 (C1), 591 (C2), 463 (C3), 55 (C4) and 221 (C5). Is there a pattern or a way to make an afghan size? 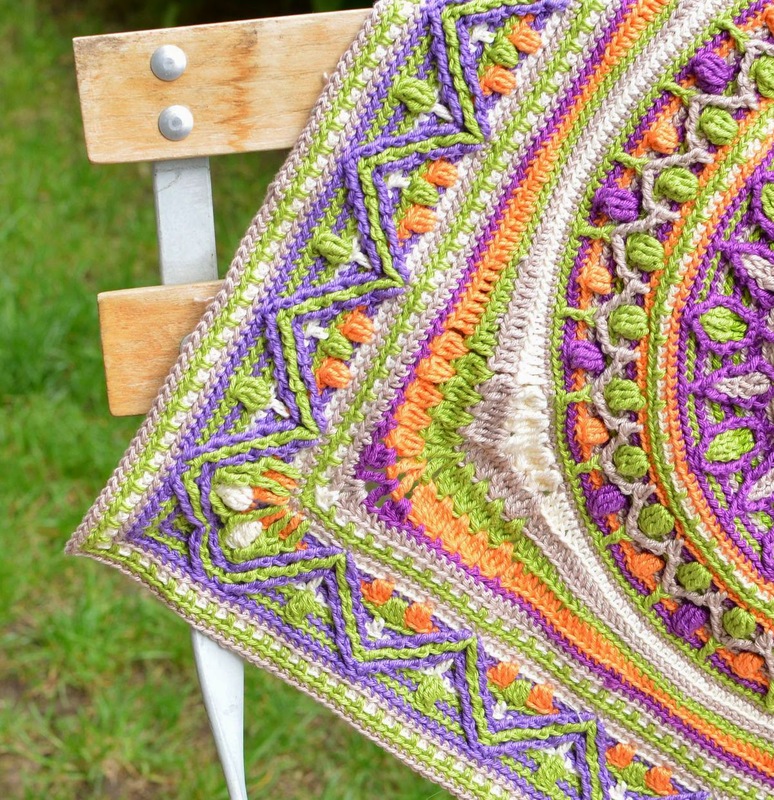 Please, check Winter Blanket by Emma Aldous on my blog. Beautiful! Just amazing! Do you put a cloth backing so it can be used as a floor rug? Yes, of course you can use is as a floor rug. I would sew anti-slip pad on the back side. 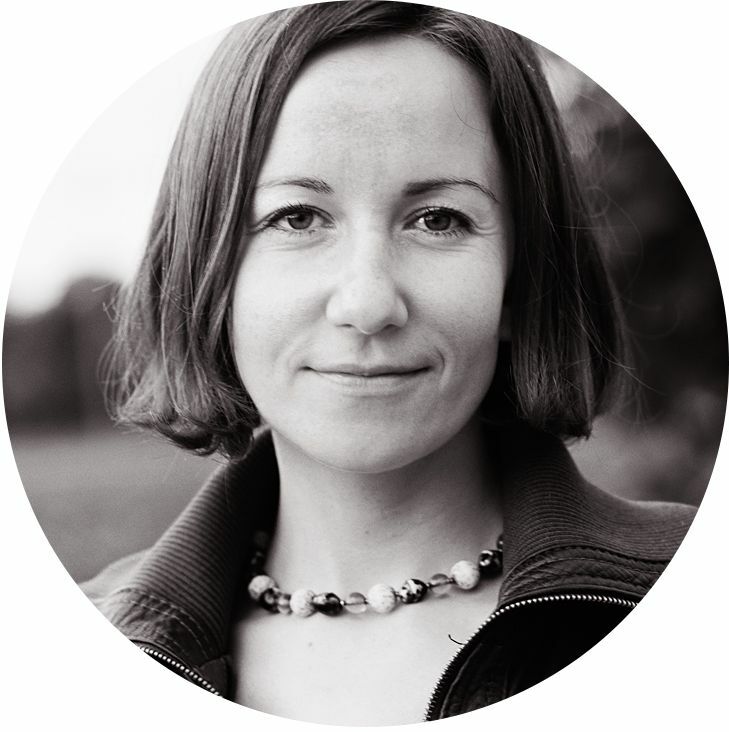 Sign up to our newsletter and stay in touch with Lilla Bjorn Crochet! Spanish Mandala: Create Your Own Sun! © LillaBjörn's Crochet World. Design by MangoBlogs.